Why we love it:Â We’ve long believed that the floor is the “fifth wall” of a room. This makes an area rug the best way to try out a new color â€” like the deep teal of this vintage rug. Why we love it: The texture of velvet gives copper a luminous look, making this sofa an excellent choice for those who want something neutral â€” but also something with a bit more presence than the typical gray or beige. Why we love it: A strong color emphasizes the form of a design, making it a true statement piece. Here, the bold teal lacquer draws the eye to the unique shape of this modern side table. Why we love it:Â This vintage accent piece has a clean shape that gives it a more sculptural feel, which is enhanced by the beautiful copper finish. Why we love it: The 1950s, 1960s, and 1970s produced colorful designs that often featured teal â€” so if you love this color, you might find more options by going vintage. 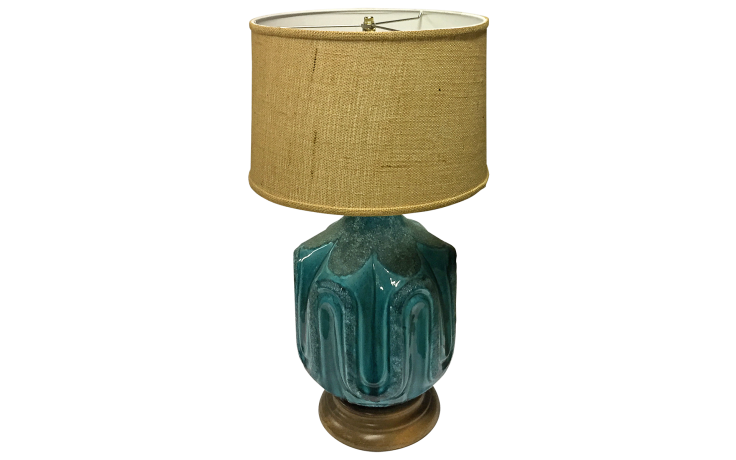 This ceramic lamp is a great example of the ’70s approach to the color, with its detailed ceramic base and rich glaze. Why we love it: Like teal, copper was also used to unique effect in vintage designs…and it doesn’t get more whimsical than this chandelier that looks like an oversized grater. Copyright: Copyright © 2019 by Sotheby's Home. All rights reserved.